I am not a fan of Leftist hero Saul Alinsky but I did find value in reading one of his books – Rules for Radicals. This book not only reveals the playbook of Team Obama (and every other Liberal) but also shows Conservatives how to use these tactics against the Liberals in what I call political Judo. For example, Alinsky’s Rule #4 (“Make the enemy live up to its own book of rules”) is something I embrace since Leftists are prone to explode into fits of false rage in order to win votes from those who are not apprised of the facts on a particular issue. That used to work almost every time because the Main Stream Media (MSM) would parrot those faux rage news stories and Conservatives were helpless to find a microphone of their own to counter the lies. But that was before the days of Twitter, Facebook, Internet radio and Blogs. Below are a few of the ways Conservatives have used the Leftist’s own rules to flip the argument and turn the Democrats arrows around and penetrate the ones who originally shot them. Starting with the comments by Rush Limbaugh regarding the Sandra Fluke testimony in early March, the Left generated a fictitious war on women meme that many liberals still claim to be real. Of course the Sandra Fluke smokescreen was nothing more than an attempt by the Left to divert attention away from the massive encroachment of government into our lives through Obamacare mandates but Liberals will never let the truth get in the way of a good ole fashioned meme. The Democrats saw an opportunity to drive a wedge between Romney and women so they ran with it but much to their frustration, the meme came to a crashing halt when a Leftist revealed which political group had a REAL war on women. Enter Hilary Rosen on Anderson Cooper 360 on April 11th when she made the incredibly ignorant comment that Mitt Romney’s wife, a mother of 5 boys, “has never actually worked a day in her life.” After given many chances to walk this comment back, she instead doubled down and revealed the true war on women which is really a war on moms who choose to stay home and take on the profession of rearing children. The original meme created out of nothing by the Left to attack Mitt Romney has now been turned around 180 degrees and the Democrats have to somehow explain how a person who has visited the White House 35 times doesn’t speak for the Democrats and especially Obama. Good Luck with that Debbie Wasserman-Schultz. The hate speech and death threats during George W. Bush’s terms as president were disgraceful and upset me more as an American than a Conservative. I think Obama is the worst president to ever hold the office and is doing more to destroy this country than any outside enemy but I would NEVER threaten the President or wish death on him. He is the President of my country and while I have the freedom to disagree with him and criticize him (as I’ve done numerous times on this blog) I still have respect for the Office he occupies and will treat him with that respect. This wasn’t true with Leftists when Bush was in office and in case you need a refresher on the type of hate speech that was directed at Bush, take a few minutes to scan through this link. I don’t recall the media outrage at these blatant death threats and hate speech but now the MSM is now up in arms about a veiled threat by Ted Nugent (yes, that Ted Nugent). Ted Nugent doesn’t speak for the Republican Party, doesn’t get messaging from Mitt Romney and can’t be linked to any establishment from the Right so why are his comments news worthy? The answer – The Left has nothing from Obama’s 3+ years to campaign on so they are desperate for any talking point that can be used to hammer Mitt Romney that they’ll pick up comments made by an ex-heavy metal rocker and rally the Leftist troops to repeat the meme within the MSM echo chamber. Hey Lefties, it’s not working! You can’t remain silent for 8 years of hate speech and death threats on Bush and then expect us to take you seriously when we see you jumping up and down about what Ted Nugent allegedly meant by his statements (And it is my opinion that he was talking more about defending his right to own guns than threatening the President). The Left expressed considerable outrage when it was revealed that Mitt Romney once travelled for 12 hours with his dog in a cage strapped to the roof of the car. 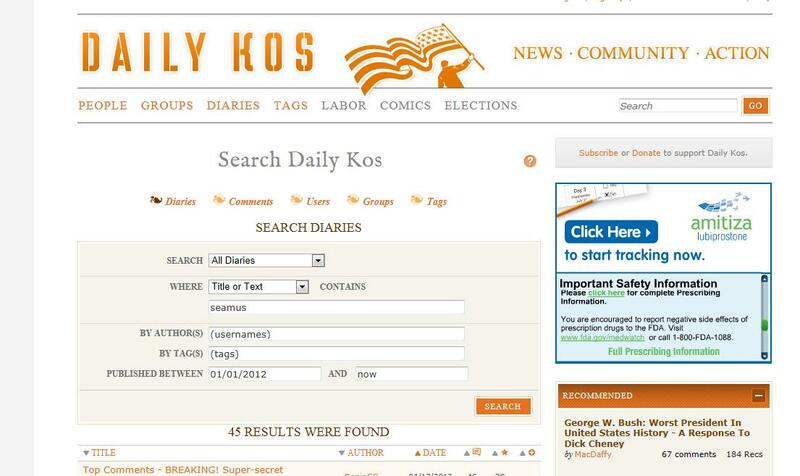 Oh how the Left hyperventilated over this and if you don’t believe me you can see this search of the word “Seamus” (the name of Romney’s dog) on the Daily Kos website which shows the term used 45 times in 2012. I have no position on this issue as I can’t speak of the details nor whether it constituted cruelty to animals but I do know this – Romney’s dog survived that trip and they didn’t eat the dog during the vacation. How a Presidential candidate acted during his pre-teen years in a foreign country has the same level of importance to me as the travel arrangements for animals during a family vacation that happened 29 years ago. Both should be left out of the political discussion but now that we know Obama actually ate dog meat then we have this to throw in the Left’s face every time they utter the word Seamus (which I bet will be never again). When Bush was President and the National Debt was equal to around 70% of GDP, then Senator Barack Obama was very upset about adding $4 trillion to the national debt. Click on this link to hear Obama blaming Bush for the debt, calling him “unpatriotic” and claiming that Bush had a “credit card from the bank of China.” Remember that Bush racked up that $4 trillion in 8 years in office so let’s see how Obama has done with keeping national debt in a more “patriotic” region. In August 2011 (less than 3 years into Obama’s term) the US had already amassed $4 trillion in debt and through March 2012 we were pushing up to the $5 trillion level. If $4 trillion in 8 years is “unpatriotic” then what do you call over $5 trillion in 4 years? Personally I call it criminal but we’ll let the voters decide in November. In 2006, when gas prices went over $3.00 per gallon, then Speaker of the House Nancy Pelosi railed on Bush to do something about it. Gas prices are much higher now even after adjusting for inflation but we can’t seem to find Nancy Pelosi or any Leftist screaming about how the high gas prices are the fault of the President. What is Obama offering to fix this current situation? Gimmicks and Boogeymen. The inconsistency of the Left on this issue of gas prices should be enough for any voter to realize that Democrats are not serious about solving problems but instead are only interested in gaining and holding onto power in DC. It’s hard not to laugh at that quote about “shovel-ready projects” knowing what we do 4 years later – those jobs were anything but shovel ready and proved to be just one of many jokes/failures related to the 2009 Stimulus that cost taxpayers $787 billion. And remember this famous video from Obama where he stated in clear terms that if the economy doesn’t recover then he deserves to be a one term President. It’s quite obvious that Obama failed miserably with regard to Economic issues during his 3+ years as President so we should hold Obama to his words and tell him in November that he deserved to be a one term President. These are just a few of the many examples where manufactured rage from the Left has been not only dispelled but turned around to bludgeon the democratic candidate it was supposed to help. Keep these memes coming Democrats, this is War and unlike the past, we are ready now! Lets not forget the next meme Mormons are such a weird and racist religion while Obama sat in Jeramiah Wright church for 20 years.